As Google tightens it’s reins on search and link building efforts, Digital Marketing Managers and SEO Manager are looking for alternative SEO tactics to increase it’s search ranking, you can let your Social Media do the SEO work for you. Earlier today, Social Media Examiner published 18 Social Media SEO Resources to Improve Your Search Ranking by Patricia Redsicker. This article has a lot of great tips on how to use Social Media to assist your SEO efforts that I cancelled my original idea for the Digital Marker’s SEO Weekly Discussion to share this article with you. As you gear up your social media efforts to help your SEO strategies, just remember to participate in social media networks where your target audience is located. Don’t waste your time with social media networks where your target audience does not participate. Having a hard time convincing your boss to try social media? Now, that you have convinced your boss to pursue social media to promote your brand, you can focus executing your social media efforts to boost your SEO with some best practices. Publish High-Quality Content – As always content is key to drive your SEO and Social Media success. After producing content that meets your target audiences needs, you can post your content in a multiple areas of the web including your website, your social media networks, your newsletters, and your blog. Make Social Sharing Easy – Produce content that your target audience wants to share. For example, I saw the 18 Social Media SEO Resources to Improve Your Search Ranking article, and I immediately wanted to share it with you. As you produce content, you will have alter the content based on platform where the content is posted. Quick example, if you write a blog post, you can’t post the entire blog post on Twitter, but you can type the title of your blog post with a link to your blog. With this example, you have basically the same content shared on two different platforms with the additional benefits of SEO finding the content. Boost Your Images and Profiles – We are a visual society, and visuals help us comprehend the written word. Therefore, we need to use images. First, save image files using your keywords. Next, when using images for your content, write an Alt Text tag that describes the image using your keywords for search engines. Don’t Forget Authorship Metadata (Google+) – Post your content to Google+ and indicate you are the author of your content. Measure Social Media Performance – As with SEO, it is critical to measure the effectiveness of your social media efforts. Develop KPI’s and dashboards to demonstrate how your social media not only increased traffic to your site, but you should create reports showing how your social media helped increase your SEO search rank. 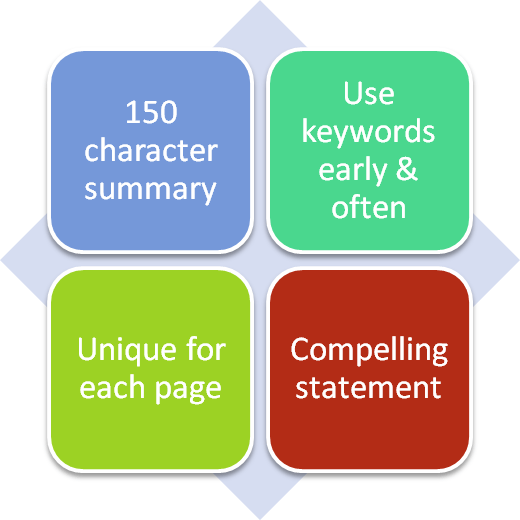 Then, you need to develop reports how your social media and SEO efforts increased revenue. While this blog post shows the importance of using social media to increase your search rank, take your time to read 18 Social Media SEO Resources to Improve Your Search Ranking and devise a plan on how to effectively use your social media to increase your search ranking. Your keyword strategies and SEO tactics have landed your website on page 1 of a search engine result page (SERP), but now, you need to convince people, searchers, to click the link to your website versus another link. A well written meta description about the content on your website can help you stand out from other websites on a SERP page. Is the likelihood of your competitor landing on the same SERP page as you high? If yes, you can use Meta Descriptions to persuade searchers and make your website seem more appealing than your competitors. The text below a webpage link on a SERP is a meta description about the content on the webpage. The meta description can lure searchers to click through to your website instead of another website. Think of a Meta Description as a short sales pitch for your webpage. This is an opportunity to engage searchers before they get to your website. Personally, when I complete a web search, I always read the meta descriptions to find out which website can meet my informational needs. Reading the meta descriptions can be a time saver, so I try to find the meta description for the best website to satisfy my search query. If I personally use meta descriptions to find the best website to click through to, I wonder how many other searchers might read meta descriptions as well. 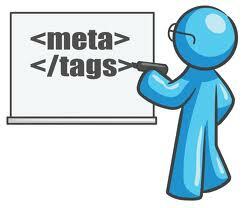 How to Write Meta Descriptions that Standout? Use Action-Oriented Language – use action words to tell readers what they will see if they click. Include a Solution or Benefit – give a convincing preview of how your content will satisfy the searchers needs. Length should be under 150 characters – the date when the content was posted could be included in the meta description, so you want to convince searchers to click through to your website in 130 characters or less. Best to be on the safe side. Be Honest – make sure your content on your webpage can deliver what your meta descriptions says it will deliver. This is your chance for searchers to build trust in your website. Don’t waste this chance. Meta Description should Accurately Describe the Content on Your Webpage, so expectations are met, and bounce rates are decreased. No Meta Description – Google will use text from somewhere on the page that matches the searchers’ query, and this text may not convince users to click through to your website. Keyword Stuffing – Only using keywords may not properly describe the content on your webpage, and you do not want to mislead searchers and risk them never clicking through to your website in the future. Bounce Rate – To avoid searchers from clicking the back button when they click through to your site, make sure the sales pitch in your meta description will be fulfilled by the content on your webpage. Be aware that a high bounce rate may hinder your SEO and reduce your ranking. Finally, don’t you hate it when Wikipedia outranks you on your keywords? Use your Meta Descriptions to stand out and lure searchers to click through to your website instead of clicking to Wikipedia. Have fun creating Meta Descriptions for your website and come back to learn more SEO tips and tools to help drive traffic to your websites from search engines and reach your digital marketing objectives.